Seven Days Blogs: Freyne Land: Obama Wins Vermont! The only question is - how large Obama's Vermont win will be? 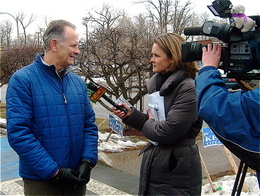 "I understand the numbers are good here in Ward 5," Burlington, Vermont's Progressive Party Mayor Bob Kiss told yours truly and Reporter Anya Huneke from NECN during lunchtime at Burlington Electric on Pine Street. "I voted earlier today," said Kiss, "and I did vote for Barack Obama for president." "I tried to think back to 1968," said Da' Mayor of Burlap. "I voted for Eugene McCarthy over then-president Johnson. McCarthy was an agent of change [and] in some respects, I hope that Barack Obama measures up to that as well." Actually, Sen. McCarthy lost the Democratic nomination to Hubert Humphrey, who lost the presidential race in November to Republican Richard Nixon. What would an Obama win mean? "I think he’s bringing this message of change," said the Ol' Kisser. "Whether he can deliver on that, I think it’s a good message for this state and time." Howard Dean voted in Ward 5 around 8:30 this morning. The press wasn't there. 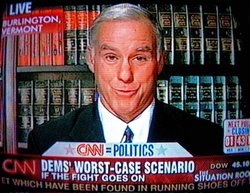 But the chairman of the DNC did appear on CNN via satellite this afternoon from WCAX-TV. Wolf Blitzer asked Dr. Dean if he was getting concerned things were getting “too nasty” between Hillary and Barack? DEAN: This is a pleasant walk in the park between what’s going to go on between the Democratic nominee and the Republican nominee. The two candidates are very close on the issues They’re incredibly articulate. Both are well-qualified to be president of the United States. The real fight’s going to start when we have the nominee. Who did Ho-Ho vote for? DEAN: I didn’t take a presidential ballot. If I’m gonna be neutral, you really have to be neutral all the way. So I voted for the school budget and so forth and so on, but did not take a ballot for the presidency. DEAN: Let’s see what the voters do. The voters are the key . The voters will make this decision. It will not be made by Harry Reid and Nancy Pelosi and myself. It will be made by the people of America voting in these primaries. We’ve had 20 million people turn out and vote so far. That’s a 50 percent greater turnout than the Republicans. That’s incredible, and apparently it’s a record turnout today. Two million people voted early in Texas. That’s unbelievable! P.S. Yours truly's taking a week off from the "Inside Track" print edition. Squeezing in a little vacation week. Check back for online updates. Great picture of HoHo. Can't decide whether he looks like the grinch or the Joker from Batman. I was thinking Bozo myself. Mh, mh, mh Max Headroom! I bet that all of you dorks look like Brad Pitt. "I bet that all of you dorks look like Brad Pitt." At least thats what your wife tells me. What's up!!! hope the Wind is At Your back. Subscribe to NOW, our email newsletter, for weekend events & discounts!